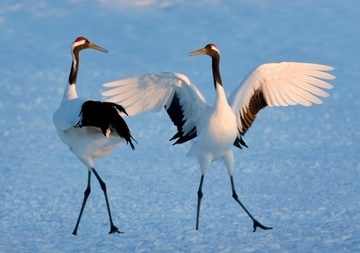 Notorious for their courting dances, red-crowned cranes (Grus japonensis) are monogamous for life once bonded in a pair. These dances don’t happen just once; a pair will dance periodically throughout the year as they reaffirm their bond. Also known as Japanese cranes, red-crowned cranes are among the rarest of their kind, with populations declining as they face habitat loss in their native ranges.